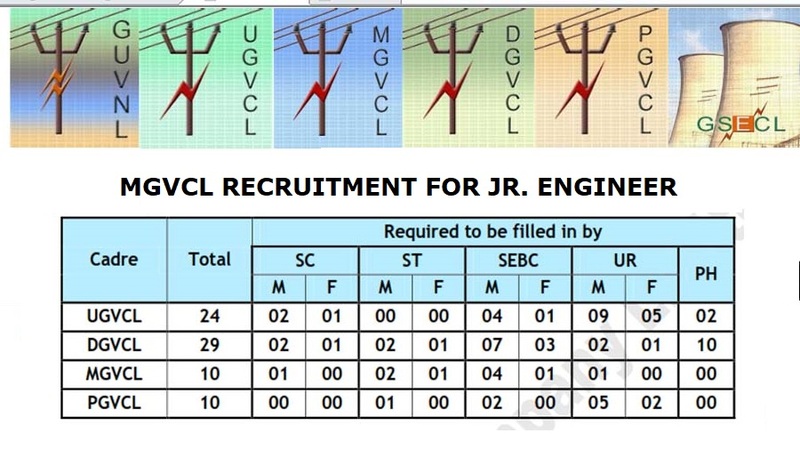 MGVCL Recruitment 2017 for Junior Engineer Madhya Gujarat Vij Company Limited Invite APPLICATIONS FOR THE POST OF VIDYUT SAHAYAK (JUNIOR ENGINEER – ELECTRICAL) on BEHALF OF GUVNL SUBSIDIARY DISTRIBUTION COMPANIES NAMELY UGVCL, DGVCL, PGVCL AND MGVCL Recruitment at http://www.mgvcl.com/ under job section. Education Qualification : Candidates need to degree Full time/ regular B.E. Engineer (Electrical)/ B.Tech (Electrical) only from Recognized University. There is no minimum percentage requirement. Selection Process: Candidates Final Selection will be on interview base and rules & regulation. The candidates shortlisted for written test/online test on basis of their “on line applications” shall be required to submit photocopies of all the relevant certificate and subsequently, the original certificates for verification as and when required. How to Apply: Candidates are required to apply ONLINE Application only through http://www.mgvcl.com/jobs.php above criteria may apply “on line” on or before 02.11.2017 before 06.00 P.M. and the payment of fees shall be made at the Branches of State Bank of India on or before 04.11.2017. If the candidates submit the Online Application, but do not forward the Hard Copy of the application with requisite documents and Fee Challan within prescribed time limit as and when asked, their candidature will be considered invalid.